There are mystical qualities about clay that speak of its beauty. The awareness of this sensory realm is what we explore with wall finishes to help create emotional and healthy spaces. As researchers, accidental scientists, craftsmen and designers, and also as builders & plasterers, we understand the importance, challenges and opportunities for clay. 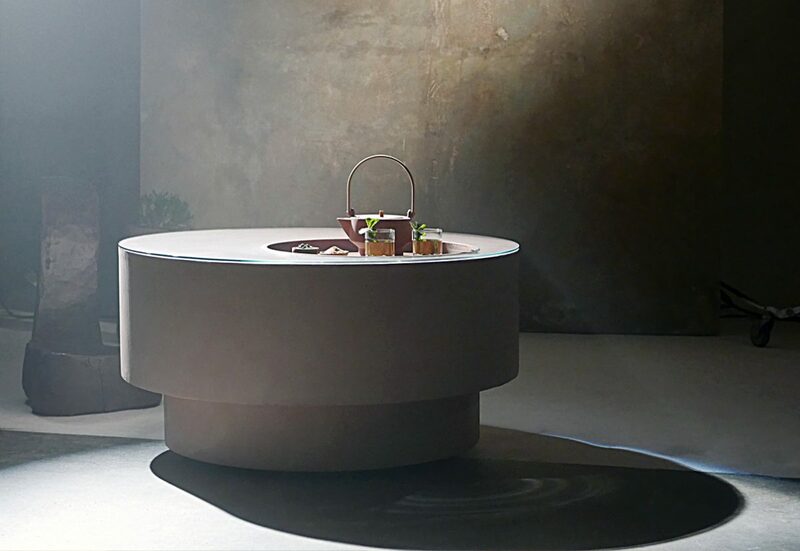 Our deep connection to the idea that putting our hands, minds and hearts into the material to allow it to discover its true form and beauty took an unexpected turn when we were invited to collaborate with Sella Concept to develop a clay finish for a table. Tatjana and Gayle, founders of London design studio Sella Concept were inspired to create the table while staying in a luxury Villa in Marrakesh with Stay One Degree, who tell the story of how the villa experience and the city stimulated the concept and design that resulted in a table with an extraordinary elegance and authenticity through simplicity and richness in texture and colour. Stay one Degree: Which key element from your stay influenced the design of the table? Gayle: While we visited the souks for inspiration we stopped into a beautiful cafe for tea. It was breath-taking – the setting, the ritual, the experience. 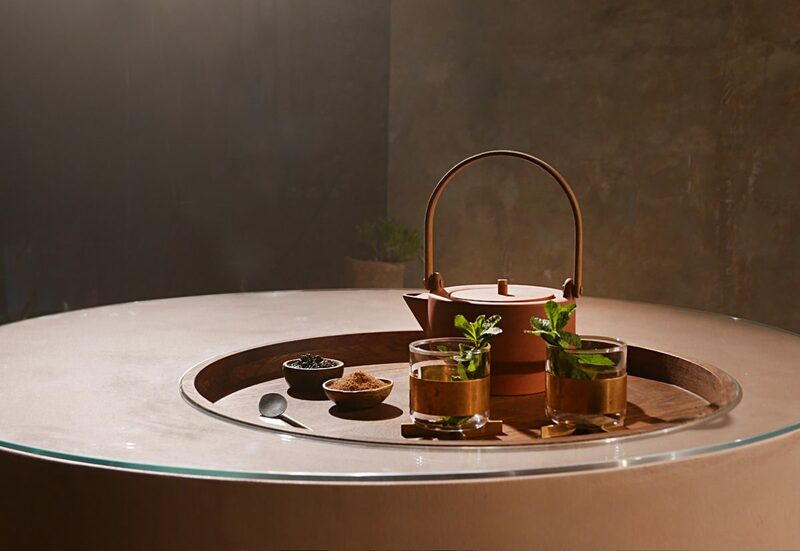 It’s such an integral part of their culture that it immediately became clear we should design a table based on the Moroccan tea ceremony. 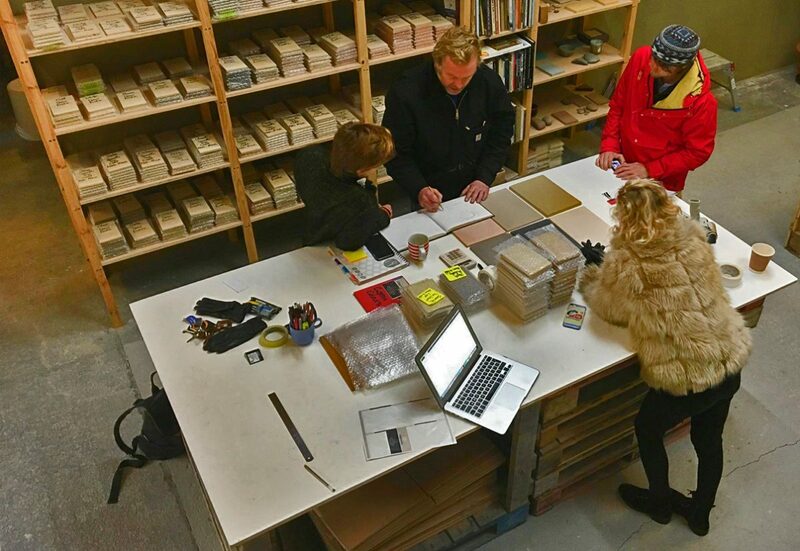 Stay one Degree: What materials did you use in the creation of the table? Gayle: We took our inspiration directly from the materials we had been immersed in throughout the city and the villa. The never-ending pink /orange clay textured walls that guided us through a labyrinth of fascinating routes, each one more unique than the previous. We discovered various furniture pieces that were constructed of old wood, packed full of personality, age and soul, and rich in colour. The combination was stunning, and we were ready to hit the studio. Stay one Degree: Why did you choose these materials? Tatjana: The huge terracotta clay and hay walls that line the property and its towering wooden gates are so rich in texture, I just wanted to take it home! We collaborated with a fantastic clay master in Cornwall, Adam Weisman*, at Clayworks to recreate this beautiful material and colouring to reflect the city’s faded palette. Tatjana and Gayle visited Clayworks, our Cornwall home for earthen materials creativity and innovation, to explore the materiality of clay plasters. The effect of dense, natural pigments and the mixes of materials and aggregates create an infinite portfolio of colour and texture and the experience of collaborative experimentation with plasters allows both the Clayworks team and designers to deepen emotional connections to the materials and the project. Video and interview highlights: Courtesy of Stay One Degree, a global member’s club connecting friends and mutual connections with a trusted network of passionate home owners and awe-inspiring homes. * Adam Weismann is Co-founder of Clayworks Ltd.